Using the VISTA telescope astronomers have discovered a previously unknown component of the Milky Way. By mapping out the locations of a class of stars that vary in brightness called Cepheids, a disc of young stars buried behind thick dust clouds in the central bulge has been found. The Vista Variables in the Vía Láctea Survey (VVV) ESO public survey is using the VISTA telescope at the Paranal Observatory to take multiple images at different times of the central parts of the galaxy at infrared wavelengths. It is discovering huge numbers of new objects, including variable stars, clusters and exploding stars. A team of astronomers, led by Istvan Dékány of the Pontificia Universidad Católica de Chile, has now used data from this survey, taken between 2010 and 2014, to make a remarkable discovery — a previously unknown component of our home galaxy, the Milky Way. “The central bulge of the Milky Way is thought to consist of vast numbers of old stars. But the VISTA data has revealed something new — and very young by astronomical standards!” says Istvan Dékány, lead author of the new study. Analyzing data from the survey, the astronomers found 655 candidate variable stars of a type called Cepheids. These stars expand and contract periodically, taking anything from a few days to months to complete a cycle and changing significantly in brightness as they do so. The time taken for a Cepheid to brighten and fade again is longer for those that are brighter and shorter for the dimmer ones. This remarkably precise relationship, which was discovered in 1908 by American astronomer Henrietta Swan Leavitt, makes the study of Cepheids one of the most effective ways to measure the distances to, and map the positions of, distant objects in the Milky Way and beyond. But there is a catch — Cepheids are not all the same — they come in two main classes, one much younger than the other. Out of their sample of 655 the team identified 35 stars as belonging to a sub-group called classical Cepheids — young bright stars, very different from the usual, much more elderly, residents of the central bulge of the Milky Way. The team gathered information on the brightness, pulsation period, and deduced the distances of these 35 classical Cepheids. Their pulsation periods, which are closely linked to their age, revealed their surprising youth. Astronomers using the VISTA telescope at ESO’s Paranal Observatory have discovered a previously unknown component of the Milky Way. By mapping out the locations of a class of stars that vary in brightness called Cepheids, a disc of young stars buried behind thick dust clouds in the central bulge has been found. 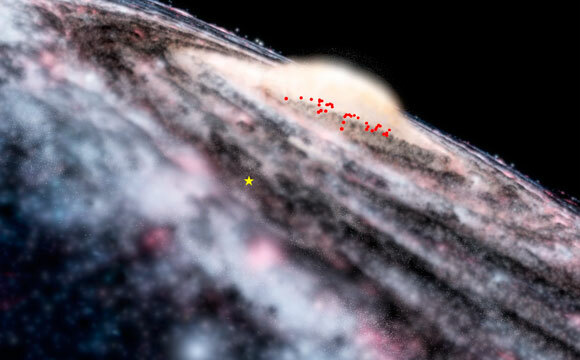 This video shows the locations of the newly discovered Cepheids (red dots) in an artist’s rendering of the Milky Way. “All of the 35 classical Cepheids discovered are less than 100 million years old. The youngest Cepheid may even be only around 25 million years old, although we cannot exclude the possible presence of even younger and brighter Cepheids,” explains the study’s second author Dante Minniti, of the Universidad Andres Bello, Santiago, Chile. The ages of these classical Cepheids provide solid evidence that there has been a previously unconfirmed, continuous supply of newly formed stars into the central region of the Milky Way over the last 100 million years. But, this wasn’t to be the only remarkable discovery from the survey’s dataset. Mapping the Cepheids that they discovered, the team traced an entirely new feature in the Milky Way — a thin disc of young stars across the galactic bulge. This new component to our home galaxy had remained unknown and invisible to previous surveys as it was buried behind thick clouds of dust. Its discovery demonstrates the unique power of VISTA, which was designed to study the Milky Way’s deep structures by wide-field, high-resolution imaging at infrared wavelengths. “This study is a powerful demonstration of the unmatched capabilities of the VISTA telescope for probing extremely obscured galactic regions that cannot be reached by any other current or planned surveys,” remarks Dékány. “This part of the galaxy was completely unknown until our VVV survey found it!” adds Minniti. Be the first to comment on "VISTA Telescope Discovers a New Component of Milky Way"